Are people like Edward Snowden and Bradley Manning standing up on behalf of the world against 'the hypocrisy of those who preach about Internet freedom abroad while stifling it at home'? For China's state-run Xinhua, According, columnist Xu Peixi makes the case for granting asylum to NSA whistelblower Snowden, who has taken refuge from U.S. authorities in Hong Kong. Edward Snowden, the NSA whistleblower who has single-handedly turned the intelligence world inside out, now on the run in Hong Kong. BEIJING: Last week, a bright idealistic young man named Edward Snowden single-handedly opened lifted the lid on the U.S. National Security Agency's PRISM program. Due to its scope, country of origin and implications, this marks the bleakest moment yet in the history of the Internet. In terms of scope, major transnational Internet service providers ranging from Google to Apple are involved in allowing the NSA to access customer data for the purposes of "surveillance." Nearly every type of service, ranging from email to VoIP, have come within the program's scope. It all originates in the country that dominates the world's Internet resources - a fact recognized in the information leaked by Snowden: "Much of the world's communications flow through the U.S." and the information is accessible. The case indicates that through outsourcing and contracting, Big Brother is breaching the fundamental rights of citizens by acquiring unfettered access to their most personal communications. As the case unfolds, there are many issues to be concerned about. How do we make sense of the fact that the market and state colluded in the abuse of private information via what represents the backbone of many pieces of modern infrastructure? How do we rationalize the character of Snowden and his fellow whistleblowers? How do we understand the one-sided accusations of cyber attack the U.S. has poured on China over the past few months? To what degree have foreign users of these Internet services fallen victim to this project? Amidst these suspicions, let us clarify two types of American personality. 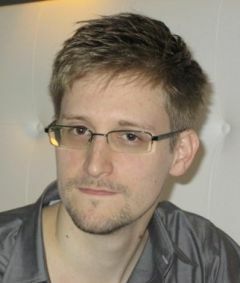 First of all, Snowden's case offers us a rare opportunity to reexamine the integrity of American politicians and the management of the dominant Internet companies that reside in the United States, and it appears that while many of these individuals verbally attack other nations and people in the name of freedom and democracy, they ignore America's worsening domestic situation. In her eloquent speech on Internet freedom [see below], former U.S. Secretary of State Hillary Clinton said that if Internet companies can't act as "responsible stewards of their own personal information," then they would lose customers and their survival would be threatened. In the same speech, she also urged U.S. media companies to take a proactive role in challenging foreign governments' demands for censorship and surveillance. Clinton certainly seemed under the impression that her own government was above reproach on these matters, when every piece of evidence, whether in hindsight or not, suggests the opposite. We must also remember that Clinton's Internet freedom speech was addressing Google's grand withdrawal from China. So following the logic of her speech, it is surely time for Google to take responsibility for leaking data and information to the NSA and withdraw from the U.S. market. David Drummond, Google's senior vice president and chief legal officer, justified Google's withdrawal from China by citing "state surveillance" and the "fact" that the G-mail accounts of dozens of human rights activists were being "routinely accessed by third parties." If Google wants to be consistent with its past statements, the PRISM program gives the Internet giant much more cause to act. Taipei Times, Taiwan: China vs. Google - Why is Taiwan Making Enemies? We can see, therefore, that when American politicians and businessmen make accusatory remarks, they turn a blind eye to their own misdeeds and have them firmly fixed on foreign nations. This calls the integrity of these rich, powerful and influential figures into question, and gives the clear impression that America bases its own legitimacy not on good domestic governance, but on stigmatizing practices abroad. Perhaps the most confusing issue revolves around the hypocrisy of those who preach about Internet freedom abroad while stifling it at home. The Fudan University students who listened intently to President Obama's speech about Internet freedom and censorship at a town hall-style meeting in Shanghai in 2009 certainly took his remarks seriously. How must they be feeling now, that it's obvious President Obama himself doesn't believe his own Internet rhetoric? In the same vein, many like-minded young Chinese once put flowers in front of Google's Beijing headquarters to pay tribute to its "brave" and outspoken challenge to perceived Chinese government surveillance. How must they be feeling in light of Google's involvement in PRISM and with the knowledge that Google's action against China are only part of its commercial strategy? An increasing number of Chinese people will come to understand that the democratization of domestic Chinese media is entirely different from that which happens abroad. Second, let us look at another kind of American personality. How can we understand and explain Snowden and similar figures? These young idealists, including The Washington Post's Bob Woodward and Carl Bernstein, who helped bring down President Nixon after the Watergate affair, WikiLeaks' Julian Assange and U.S. soldier Bradley Manning, among others, can be categorized as the "bright feathers" of our time, to borrow words from the popular American movie The Shawshank Redemption. They all embody the courage to fight the system, which the film also celebrates. The 25-year old Manning is now a prisoner, having been arrested in Iraq in May 2010 on suspicion of having passed classified material to WikiLeaks. Assange has been confined in the Ecuadorian Embassy in London for nearly a year. Snowden is on the run in Hong Kong. While human rights activists from developing countries (certainly as far as Western agencies are concerned) are often blessed with a range of hiding places, we now see the dilemma of Western dissidents. 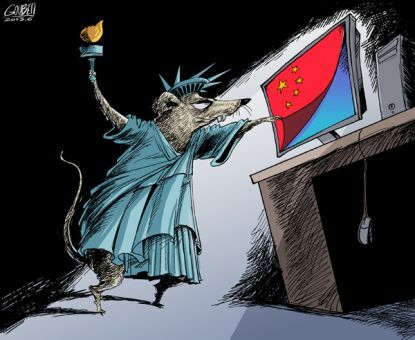 For this reason China, despite the fact that it doesn't have a good reputation as far as Internet governance is concerned, should move boldly and grant Snowden asylum. After all, what American and British authorities have done to people like Snowden represents a challenge to the common sense of the global public. These people are too brilliant to be caged. Their feathers are too bright. For the emerging evils that have been committed and continue to be done by the alliance of state and market in the digital age, Snowden and those like him represent the hope and possibility that counter measures exist to combat them. Unfortunately, those who proclaim to the world "don't be evil" are themselves, as they are willing conspirators in the game, and their drive for profit has led them to play a major role in this evil. If intelligence work can be contracted or outsourced this way, anything can. That is why we appreciate and salute the efforts of Snowden et al., who have gambled their careers, family, personal freedom, and even their lives to let the global public know what the most powerful force in the world is doing with perhaps the central infrastructure of our age; and to make the public aware that this force is acting in an unconstitutional manner and entirely contrary to the Universal Declaration of Human Rights. To further understand the likes of Snowden, let us end with a narrative by the character Red from the Shawshank Redemption as he rationalizes the escape of his friend Andy: "Some birds aren't meant to be caged. Their feathers are just too bright. And when they fly away, the part of you that knows it was a sin to lock them up does rejoice." *Xu Peixi is Associate Professor at the Communication University of China, Beijing. He is also a PhD candidate and researcher at the University of Tampere, Finland. His research interests include International Communication, Citizen Participation and New Media. He can be reached at xupeixi@gmail.com.